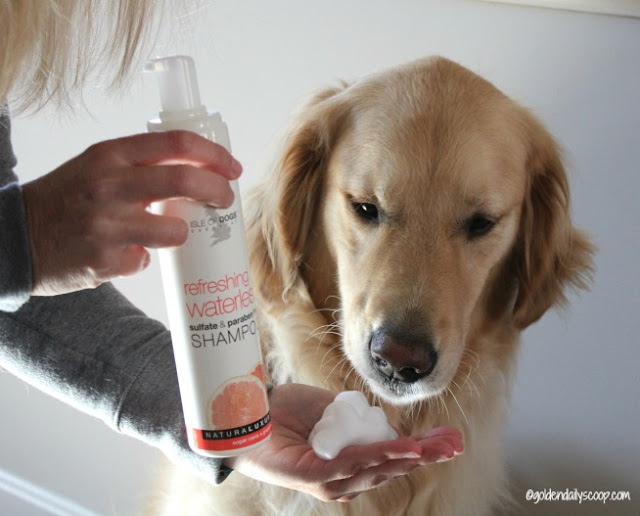 It's no secret that Golden Retriever's require a lot of grooming and upkeep. 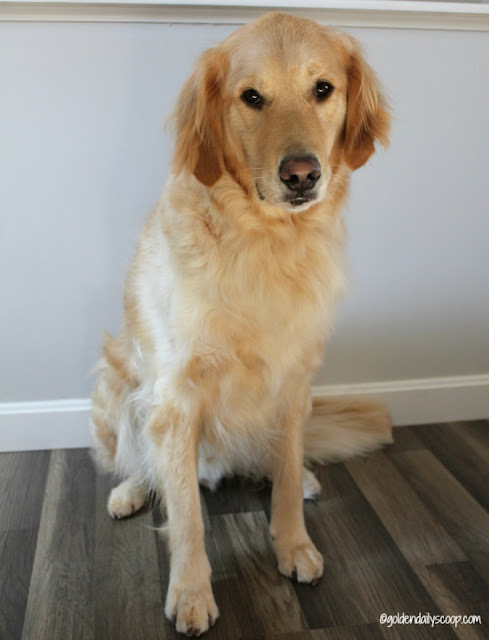 Depending on what kind of Golden you own, their coat and how active they are will determine how often you should schedule a grooming appointment, usually this falls between 6-8 weeks for a complete head to tail groom. 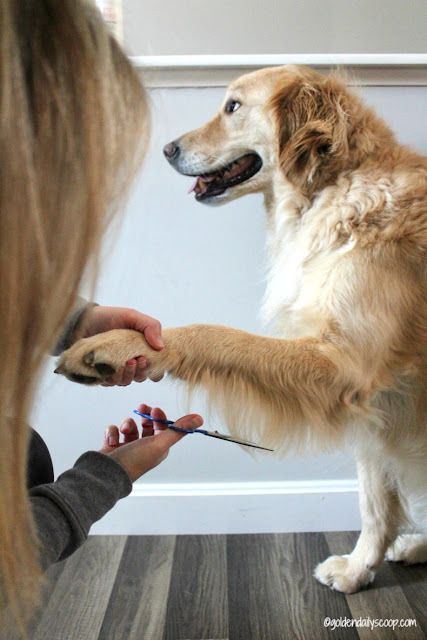 Over the years I have developed a few tips on how to keep my Goldens looking their best between grooming appointments. 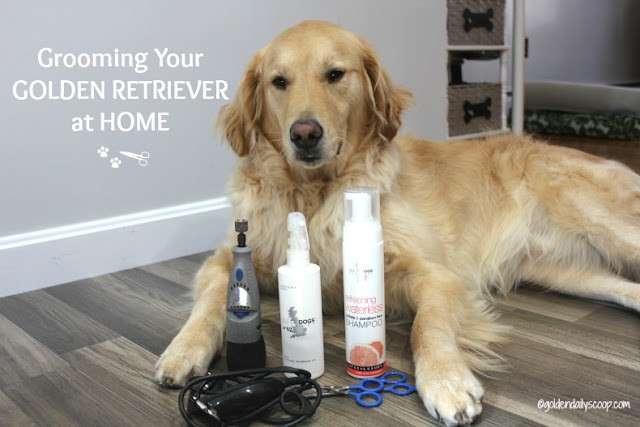 Whether you are trying to stretch out their appointments, like to have them look their best for the holidays or your Golden just doesn't do well at the groomers, these basic grooming tips will help to keep them looking clean and trimmed. This post is sponsored by Isle of Dogs™. I am being compensated to share our experience with Isle of Dogs products, but we only share information we feel is relevant to our readers. Isle of Dogs is not responsible for the content of this article. 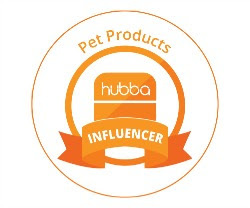 This post contains affiliate links, if you click on a link and make a purchase we may receive a small percentage of the sale at no extra cost to you. Before I begin, I brush the entire coat making sure to get out any tangles or knots which are usually behind the ears, the hindquarters and tail. Next, I like to use Isle of Dogs™ Refreshing Waterless Shampoo to clean their coat. 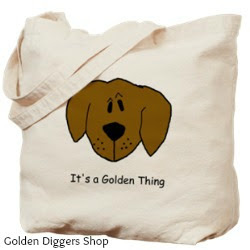 This is a great option if you can't give them a bath or if you have an older Golden that doesn't enjoy bathing. It's sulfate and paraben free so it's gentle enough to use often without having to be rinsed out. Just pump a good amount into the palm of your hand (it smells amazing!) and rub into their coat. I like to pay special attention to their chest, for some reason this is the first spot that starts to show dirt and grime. After I've gone through the entire coat I let it air dry for a bit. 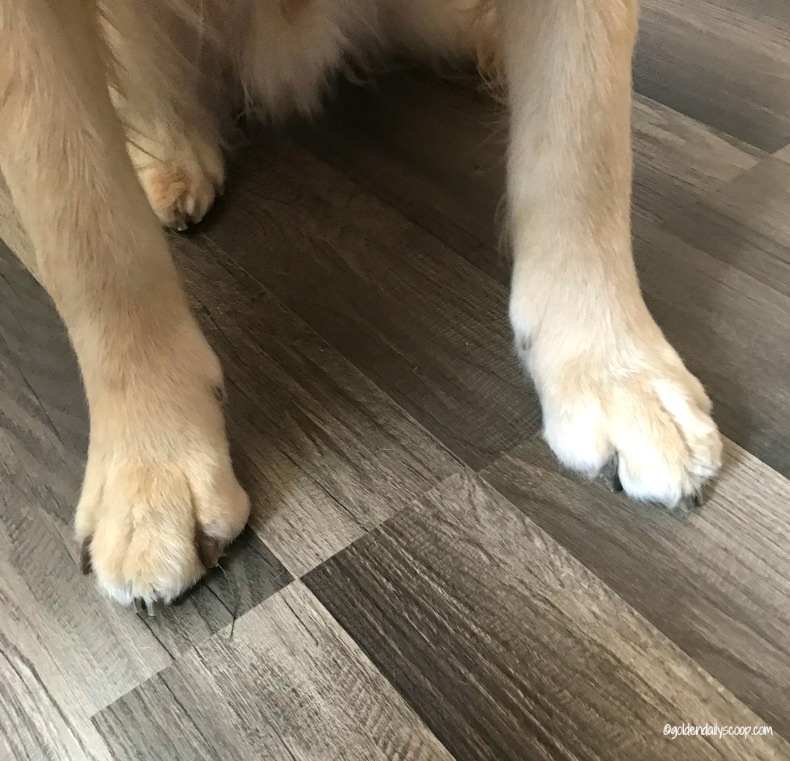 If there is one thing that drives be bananas on my Goldens is "grinch feet", the long hair that grows between their toes that takes on a life of it's own. I use Top Performance Ball-Point Shears to trim the hair after brushing it backward. I like these scissors because they have a ball point so the tip isn't sharp, just keep brushing the hair back until it is completely even and smooth. 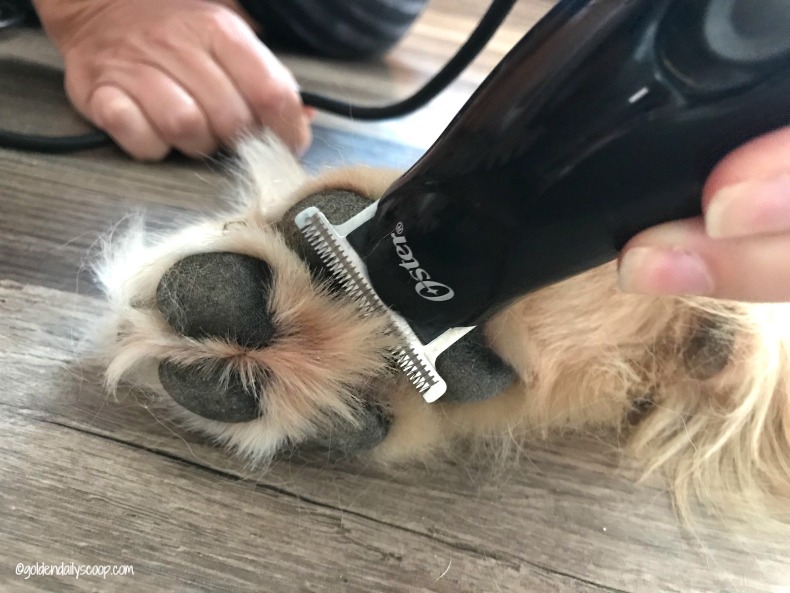 I like to use the Oster Pro Trimmer to trim the fur on their pads. 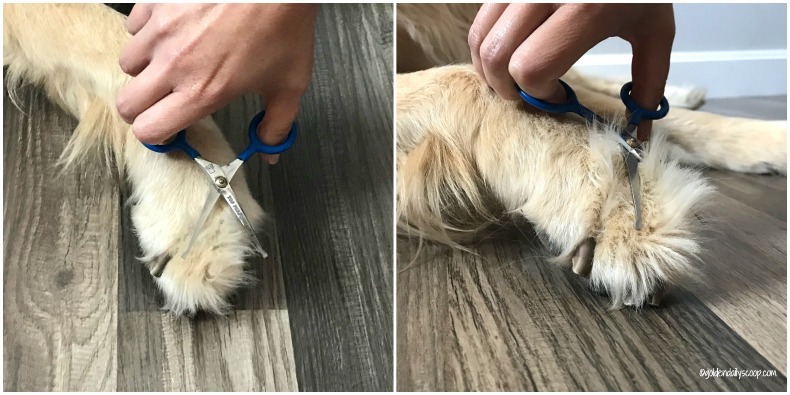 You can use the scissors I used for the foot fur but I like the trimmer because it gets close to their pads without having to worry about cutting them - better to be safe than sorry! Bruin doesn't have thick feathers on his front legs, so it's easy to keep these looking good. I use the Top Performance Fine-Point Shears to just clean up the edges to make them look a little more tidy. 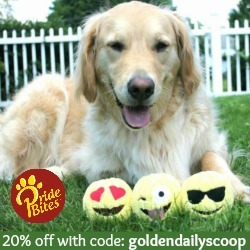 I swear my Golden's nails grow like weeds. As soon as I hearing them clicking on the floor, I know it's time for a trim. I find it much easier using a dremel tool rather than nail clippers. With the clippers you really have to be careful to not cut the quick which will bleed. 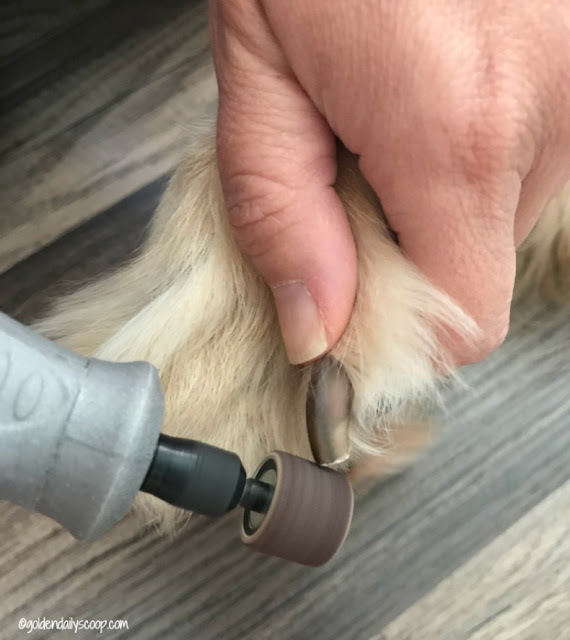 I like to use the Dremel Pet Nail Grooming Tool as an alternative, it's a quick way to shorten the nail with a smooth finish. The cordless dremel tool has a few speeds, so start on low until your dog is used to it. Just make sure any fur is away from the dremel and never apply pressure or leave the sander touching the nail for longer than a second. 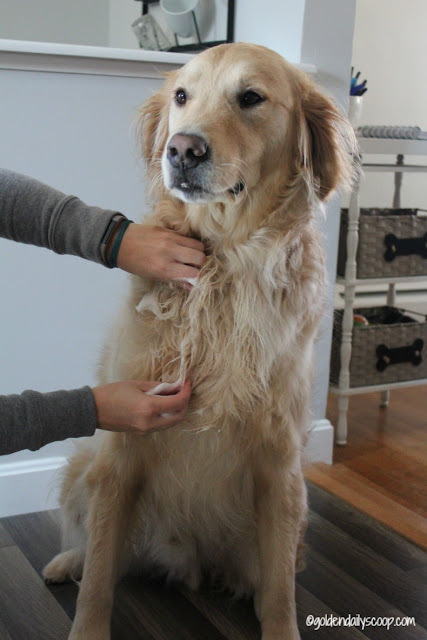 After you have finished trimming, your Golden's fur should be dry and smell amazing! The final thing I do is spray Isle of Dogs Conditioning Spray throughout the coat with a final good brushing. This conditioning spray is a primrose oil rich spray combined with herbal extracts to soothe skin, alleviate flakes and freshen and add shine to dull coats which helps extend time between baths. 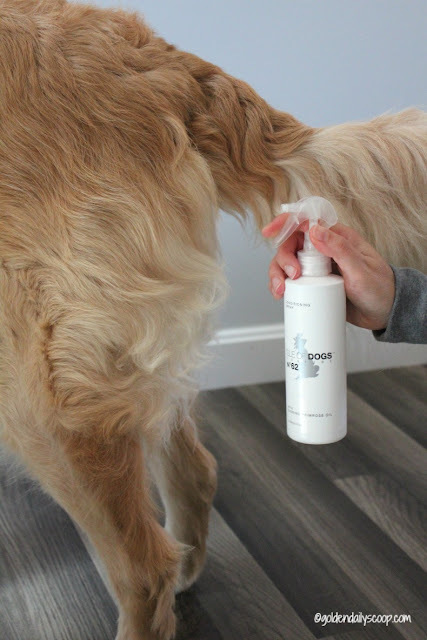 Since I don't trim Bruin's hind leg feathers or his tail, this spray keeps those areas looking healthy, shiny and soft! Here is Bruin after our grooming session. He looks pretty darn good for not having a full bath, he smells great and feels so soft! The one thing I didn't touch on today is the ears. As you can see, Bruin has crazy ear hair and I am just not brave enough to touch them so that is the one thing I leave for the professionals. As you can see with just a few simple steps, you can keep your Golden looking their best between their grooming appointments. 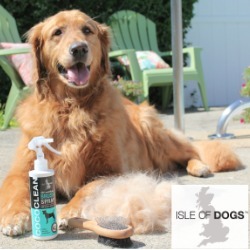 You don't need to do it all in one day, if you are just starting out start with the Isle of Dog's Waterless Shampoo and Conditioning Spray followed by daily brushing and you will notice a big difference. Then you can try trimming the feathers, paws and nails! 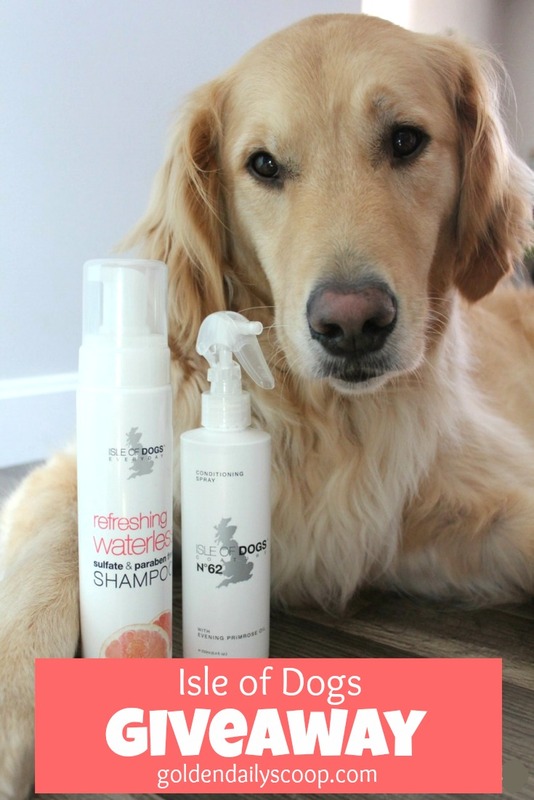 Isle of Dogs Waterless Shampoo & Conditioning Spray! My Golden Retriever was a leaner when he got a bath. I always told him that he was like washing a semi truck! LOL! They are such a beautiful breed. I miss my Tucker every single day. Mr. N gets dirty easily as he's so low to the ground! 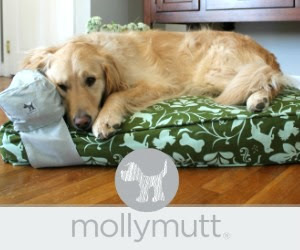 I have a golden retriever/Alaskan malamute mix and he is one hairy beast so I need this to keep his coat in tip top shape. I simply love Isle of Dogs products. I have three rescued Coonhounds. 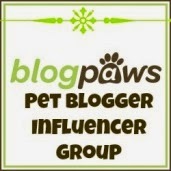 None of them like getting baths, and while they have short fur which is easier to care for, it still needs to be cleaned and conditioned and I love the idea of being able to use these products to keep my dogs looking and smelling nice. I have 3 dogs and believe me they could all really use it. Too keep them smelling great and looking good this would help so much. We all land at the spa about every two months. Mom tires easily of grooming all three of us who don't like to be groomed. We do get our nails done weekly, monthly ear cleaning and other random touch ups. You look very nice with your in between groom. These items would work great on my dog. Believe would work good on my dog, easier way to give bath. This would be great for my dogs in between baths.